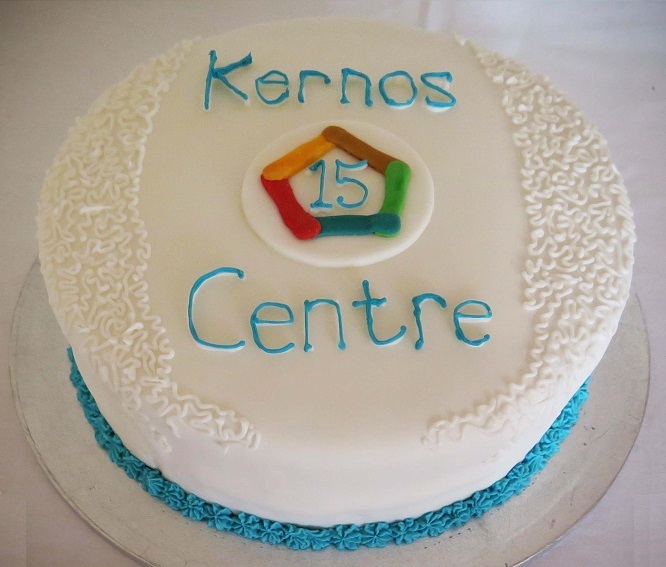 Around 50 people attended the 15th anniversary celebration of the Kernos Centre’s opening, held on 6th April at Sudbury’s Masonic Hall – the venue being provided free of charge for the occasion, as was the splendid buffet provided by The Bridge Project. 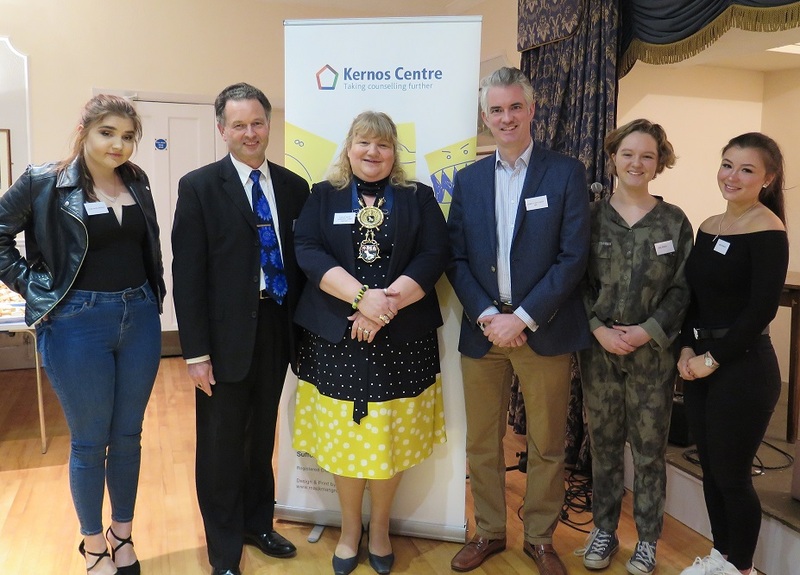 Kernos Director Graham Hill welcomed Sudbury Town Mayor Sarah Page, thanking her for choosing Kernos as one of her supported charities during her term as Mayor and inviting her to open the evening. The Mayor spoke of her support for the vital work that Kernos provides in the community. She said that since Kernos opened 15 years ago it had received over 3,200 referrals for counselling support for local children and adults. She had also made a cake, complete with Kernos logo, to mark the occasion! South Suffolk MP James Cartlidge, a member of the All-Party Parliamentary Group on Mental Health, attended the evening along with Babergh District Councillors Adrian and Jan Osborne, CEO of the Befriending Scheme Shirley Moore, Ruth and Phil Worsley from the Sudbury Cancer Support Group and Rob Allen from the Bridge Project, all ardent supporters of the Centre’s valuable work. Director of Counselling Chris Boatwright said: “The local need and demand for our services is much greater now than when we first opened. 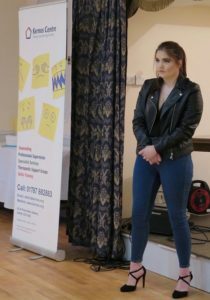 Kernos has already received 123 referrals so far in 2018 and are currently providing 80 face-to-face counselling sessions per week. I do believe we are the ‘net beneath the net’ for so many vulnerable people in our local community”. Finance Director Peter Brown said: “Donations, client contributions and fundraising make up more than half of the revenue for Kernos. Our thanks go to all that support us in the community. Babergh District continue to support us year on year with important contributions to core funding, and Suffolk Community Foundation give tremendous support with our grant applications. Sudbury Town and Parish Councils and many other local organisations have also supported us with donations”. 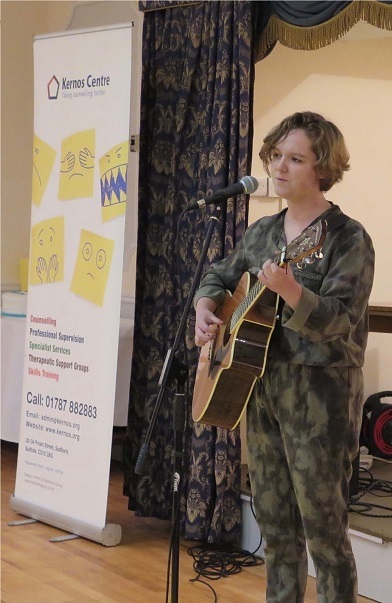 Highlights of the evening were two musical performances by local young people: 17-year old Lydia Page-Wright (left), a 6th Form student at the Thomas Gainsborough School, sang ‘I Will Fix You’ by Cold Play and ‘Bridge Over Troubled Water’, Simon and Garfunkel’s classic, while 15-year old Evie Press (right), a student at Colchester County High School, also sang two songs that she had written and composed herself. Both young people, who declared that they supported everything that Kernos stood for, made a huge impact on the audience and received huge applause. 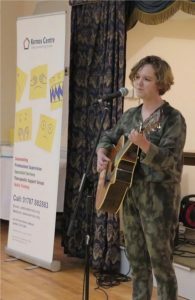 Another young person, 18-year old Ami Crowley, announced that she would be doing a sky-dive on the 17th of August to raise funds for two charities: “I am fundraising for Marie Curie Cancer Care and the Kernos Centre. They are both fantastic organisations and I can’t thank them enough personally. The money I raise will go to help those in need, and also as a thank you to both charities for everything they have done for me”. Pictured at the celebration are (from the left): Lydia Page-Wright; Kernos Director Graham Hill; Mayor of Sudbury Sarah Page; South Suffolk MP James Cartlidge; Evie Press; Ami Crowley. For more information on Ami’s sky-dive go to: www.gofundme.com/yqpv3-charity-skydive.